The lack of association between statin use and CHD mortality changes. The proposal was to investigate whether a change of statin use during a period of time would be associated with a proportionate decrease in death rate from coronary heart disease (CHD). This is a reasonable proposition in light of the alleged great benefit of statin medications in reducing CHD death rates. The study compared statin use and CHD mortality between 2000 and 2012, among Western European countries. The countries chosen were Finland, Scotland, Germany, Sweden, Norway, Denmark, the Netherlands, Italy, Belgium, Spain, Portugal and France. They all have similar public health systems, with statutory health insurance and universal coverage, based on either direct taxation or income-related contribution. The shows a very significant reduction of CHD rates during just 12 years between 2000 and 2012. This is approaching the end of the epidemic. There had already been an 80% reduction in CHD in the UK during the 20 years between the peak in 1970 and 1990. There was a wide range of CHD mortality reduction, ranging from 26% in Italy to 56% in Denmark, shown in Figure 1. The increase in statin utilisation between 2000 and 2012, shown in Figure 2, varied from 121% in Belgium to ten times that, 1264% in Denmark. The absolute statin use in each of the years was calculated as Defined Daily Dose per 1,000 population per day. It is the percentage change that is of the greatest importance. The increase is quite remarkable. more patients with higher income and educational levels started statin treatment compared to patients with lower income. We can see some important factors from Figure 3. 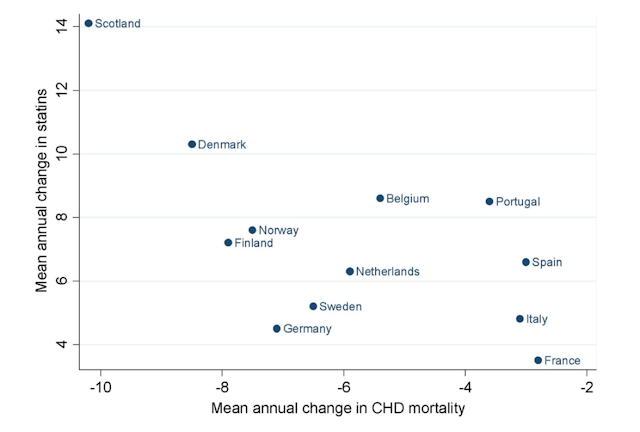 1 The countries on the left, showing the greatest negative change (reduction) in CHD deaths during the years 2000–2012 are those the had the highest death rates during the epidemic. 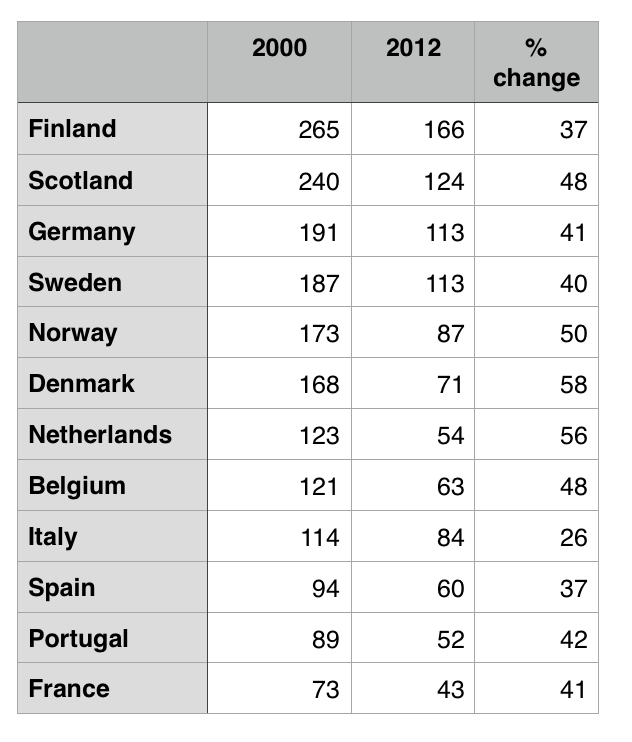 Those on the right (Portugal, Spain, Italy, France) had the lowest death rates. 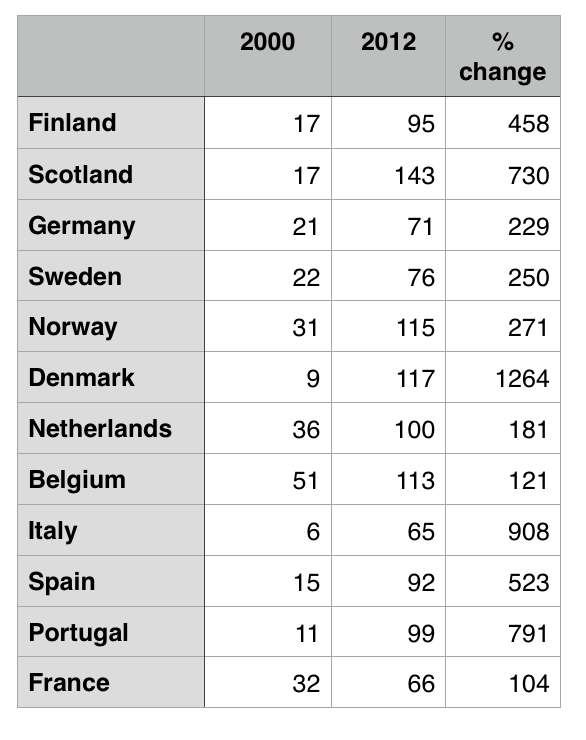 2 Portugal, Spain, Italy, France had a similar change in CHD mortality (-3%) but very different increases in statin use (between 2.5 and 8.5%). 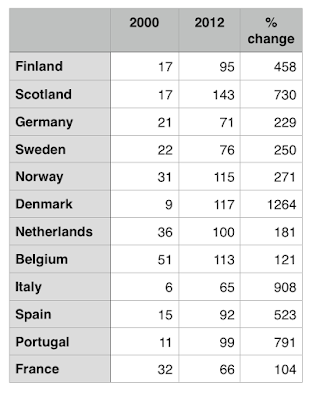 3 Finland, Norway, Netherlands and Spain had a very similar change in statin use (about 7%) but very different reductions in CHD mortality (between -3 and -8%). The specific risk factors underlying this statement are far from clear. Cigarette smoking is clearly one important reversible factor that has been reversed in recent years. But what are the others? Dietary change has not been shown to have a significant effect on CHD mortality. Family history is very important but it is not reversible. Socio-economic status is also of great importance, but it is not easily reversed. The “unknown factors” are of greatest importance. If we accept a microbiological cause of CHD, then the reason for the fall in mortality becomes straightforward: it is the development of immunity within the population. The paper also states that “Clinical trials show that statins lower the absolute risk of coronary death by less than 1% (primary prevention) and 3.5% (secondary prevention). Further comments are made concerning the attitude of doctors in respect of the initiation of statin treatment, that it is influenced by factors not directly related to the actual patient risk. The gender and length of clinical experience of doctors is important, also the attitudes of patients to medicines, drug reimbursement policies (in certain countries, unspecified but presumably the USA), prescribing restrictions and marketing by pharmaceutical companies. There is also a comment concerning the influence of the extensive marketing campaigns by the pharmaceutical industries on the decision of doctors concerning statin treatment. I have pointed out in previous posts that the decline of CHD deaths that marked the end of the epidemic has not been explained by known factors. 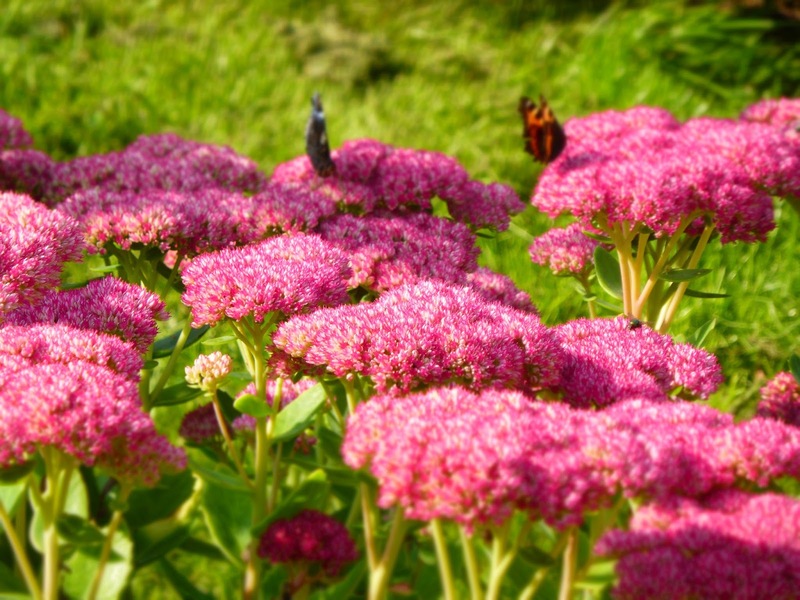 It occurred before the introduction of statins and any other effective medical intervention. It would appear to be spontaneous, and perhaps because of the development of immunity with the population. The value of statins has been greatly exaggerated. What about people with a familial hypercholesterolemia? I have a confirmed mutation, with a family history of CVD. For now I am 32, ultrasound of my main arteries did not show any deposits (at least nothing was visible, but that's not a very precise examination). My total cholesterol is around 400 mg/dl (~10 mmol/l) with HDL of around 65 mg/dl (~1.65 - 1.8 mmol/l) with my standard diet. They tried to lower LDL with ezetimibe and it got down to around 270 mg/dl (7 mmol/l) while keeping HDL at its former level. With these numbers, they really want to give me statins, while previously claiming that ratio LDL/HDL was sufficiently good after ezetimibe (now they want to treat LDL to about 2.5 mmol/l, which is around 100 mg/dl, which sounds amazingly low total cholesterol for me). Other than that I am ok, healthy, TGD is low, everything else is great, I have physical activity and can do high intensity exercise. Do you think statins are necessary? Is there any way, other than LDL levels, to assess the risk of CVD?